If enough energy is supplied to an electron of a particular atom, it can be promoted to successively higher energy levels. If the supplied energy is large enough it may possible to remove the electron completely from the pull of the positive nucleus. The amount of energy required to remove the most loosely bound electron, that is outermost electron from an isolated gaseous atom of an element in its lowest energy state, that is ground state to produce cation is known as Ionization Potential or Ionization Energy of that element. It is generally represented as I or IP and it is measured in electron volt (eV) or kilo calories (kcal) per gram atom. One electron volt (eV) being the energy gained by an electron falling through a potential difference of one volt. The electrons are removed in stages one by one from an atom. The energy required to remove the first electron from a gaseous atom is called its first Ionization potential. The energy required to remove the second electron from the cation is called second Ionization potential. Similarly we have third, fourth Ionisation potentials. The greater the distance of an element from the positive charge nucleus of an element, the weaker will be the attraction and hence the lower the ionization potential of that element. If an atom is raised to an exited state by promoting one electron to a higher energy level, then that electron is further from the nucleus and it is observed that this excited electron is more easily detached than when the electron is in its ground state. Thus on moving from top to bottom in a group the ionization potential of the elements decreases with the increase of their nucleus electron separation. The successive increase in their values is due to the fact that it is relatively difficult to remove an electron from a cation having higher positive charge than from a cation having lower positive charge or from neutral atom. The higher the charge on the nucleus the more difficult it is to remove an electron and hence the higher the value of ionization potential. Thus the value of ionisation potential generally increases in moving from left to right in a period, since the nuclear charge of the elements (atomic number) also increases in the same direction. With increasing atomic number electrons are added to orbitals of the same principal quantum number. These electrons add little to the size of the atom, the increasing nuclear charge bring about a contraction in size. In effect therefore ionisation potential steadily increases along a period. According to the Hund's rule atoms having half - filled or completely filled orbitals are comparatively more stable and hence move energy is needed to remove an electron from such atom. The ionization potential of such atoms is therefore relatively higher than expected normally from their position in the periodic table. A few regulation that are seen in the increasing vale of ionization potential along a period can be explain on the basis of the concept of the half - filled and completely filled orbitals. Be and N in the second period and Mg and P in the third period have slightly higher vale of ionization potentials than those normally expected. This is explained on the basis of extra stability of the completely - filled 2S - orbital in Be (2S²) and 3S - orbital in Mg (3S²) and of half - filled 2P - orbital in N (2S²³2P³) and 3P - orbital in P (3S²3P³). Electrons provide a screening effect on the nucleus. The outermost electrons are shielded from the nucleus by the inner electrons. The radial distribution functions of the S, P, d orbitals shows that for the same principal quantum number the S - orbital is the most penetrating., next is P - orbital and least penetrating is the d - orbital. Screening efficiency falls off in the order, S〉P〉d. As we move down a group, the number of inner - shells increases and hence the ionisation potential tends to decreases. An increasing in the overall charge on the ionizing species (M⁺, M⁺², M⁺³, etc) will enormously influence the ionization potential since electron withdrawal from a positive charged species is more difficult than from a neutral atom. The first ionization potentials of the elements very with their positions in the periodic table. 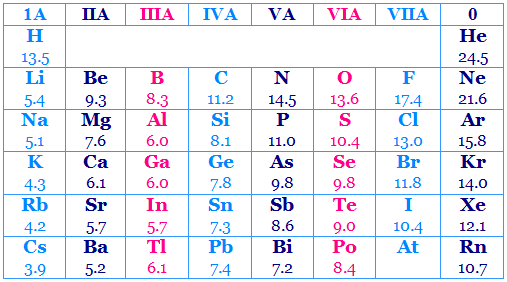 In each of the table the noble gas has the highest value and the alkali metals the lowest value for the ionization potential. Calculate the ionization potential of Hydrogen atom in eV. We know that, the energy corresponding to the transition from n = ∞ to n = 1 gives the ionization potential of the hydrogen atom. The ground state electronic configuration of helium is 1S². The second ionization potential means removal of the second electron from the 1S orbital against the nuclear charge of +2. In first transition series electron filling up processes begins in the 3d level below a filled 4S level. During ionization process will a 4S electron or a 3d electron be lost first ? Explain with reference to Chromium. Hence a 3d electron is more tightly held than a 4S electron. So during ionization the 4S electron lost first. Arrange the following with the increasing order of Ionization Potentials Li, Be, B, C, N, O, F, Ne.